LMBO! You make me laugh so hard Oskar! I especially love the way you “improved” the picture of the squirrel! Did you do that? Or did your mom person do that? Hey Hey Oskar…Good JOB! Did you get that ol’ Devil! I chase ’em all the time. 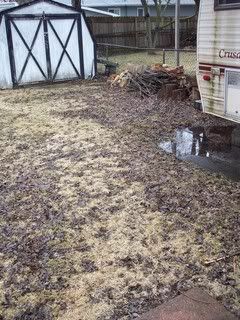 Glad my man owner is BIG on yard work and GREEN Grass…I can run mad all over…and well, I do bring in lots of leaves though. Whew..glad for vacuums! but I run from that…hate that loud sound..kinda like your storms! You’re such a brave schnazuer – we’re very impressed! Yours admiringly – JD and Max. Oh, Oskar – we totally understand the obsession with the "devil squirrel" – we have those pesky kritters here too & we take our jobs as Head of Security very seriously! It's full time work keeping them off our property! But did you get the squirrel?? Poor doggie getting a bath!!! Mine is up over at Feather, Fur, and Fins. 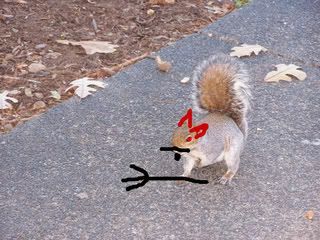 Devil squirrels are pure evil. We only have black squirrels around here. My squirrel used to aggravate one of my dogs, so you are not alone. You’re a cute one Oskar. Boys will be boys, right? Bwaaaaaaaahahahahahahaha Pooor Oskar! But it was fun while it lasted, wasn’t it??? Did you teach that squirrel a thing or two? I have a fit of the giggles! I don’t know…who is the devil? The squirrel or the bather? Thanks for stopping by.. I love your blog. If you don’t mind, I may follow u.
Oskar ~ You are very cute! Thanks for visiting my blog and for Windi’s birthday wish. We hope you had fun with that squirrel. 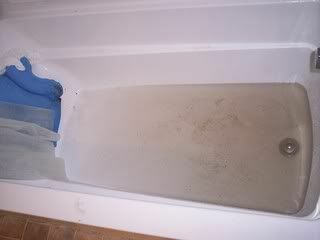 We have to endure daily baths or rinses until our backyard dries up. We can’t wait for warmer weather. 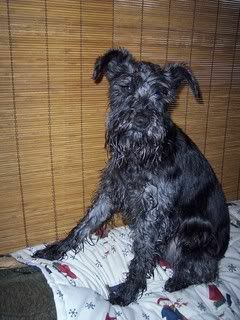 Oskar: Don’t you feel all clean when you are done with that bath?